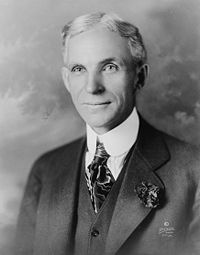 Henry Ford was the American founder of the Ford Motor Company and father of modern assembly lines used in mass production. His introduction of the Model T automobile revolutionized transportation and American industry. He was a prolific inventor and was awarded 161 U.S. patents. As owner of the Ford Motor Company, he became one of the richest and best-known people in the world. He is credited with "Fordism," that is, the mass production of large numbers of inexpensive automobiles using the assembly line, coupled with high wages for his workers. Ford had a global vision, with consumerism as the key to peace. Ford did not believe in accountants; he amassed one of the world's largest fortunes without ever having his company audited under his administration. Henry Ford's intense commitment to lowering costs resulted in many technical and business innovations, including a franchise system that put a dealership in every city in North America, and in major cities on six continents. Ford left most of his vast wealth to the Ford Foundation but arranged for his family to control the company permanently.